Pan-seared steaks, chops, chicken, and fish fillets are delicious and quick-cooking. Here, we show you how to step up their flavor and texture by basting them with butter. Is there a single best way to cook a steak or a pork chop or a piece of fish? It's an alluring idea, but it's also an impossible one. The best method depends on the results you want. Let's consider a steak. If you value consistency and a perfectly cooked center from edge to edge with almost no doneness gradient, then sous vide or the reverse sear are the best methods for you. For a lot of people reading this, those qualities may seem like a foregone conclusion—of course a perfect medium-rare center throughout is what we're all after! Except that's not true. I, for one, tend to value other qualities more, and I know a lot of professional and amateur cooks who agree with me. I'll often trade that perfect edge-to-edge doneness for a more deeply browned crust, with a crackling crispness and a flavor of roasted meat that's so deep it triggers some primal ganglion of nerves in my brain to howl in delight. At least, I value that most of the time. In other instances, say when I'm entertaining friends and need to cook several steaks perfectly at once, or when I'm cooking a larger roast, I'll go for sous vide or the reverse sear. They make success easy, they're relatively hands-off, and they deliver absolutely excellent results. And that's why I want to cast our gaze back toward an older-school method of cooking meats and fish, one that doesn't start by cooking low-and-slow to the proper internal temperature à la sous vide and the reverse sear. Instead, it's a classic pan-searing technique called butter-basting that, for my money, often gives me the kinds of steaks, chops, and fish I crave. There are a few drawbacks: It requires more practice and finesse than those other methods, it's not nearly as foolproof, and it will give you some sort of gradient of doneness—that gray band of more well-done meat just below the surface. But, in exchange, it delivers an unrivaled crust and a depth of flavor that's hard to match. If you're the type of person that likes chewing on the deeply roasted ends of a fatty steak, this may be the method for you. Below, I'll walk you through the ups and downs of butter-basting, and how to do it for steaks, pork chops, veal chops, chicken breasts, fish fillets, and more. The method is mostly the same for all of them, save for a few small details that differ for fish. Is butter-basting absolutely the best way to cook a steak or other piece of meat? No. But it might be the one you want to use, depending on what you're after. So, why might you want to pan-sear a steak or other cut of meat with the butter basting method? An incomparable sear: By starting the meat in a hot pan with hot oil, and then continuing to cook it in that pan with butter, you give it ample time to develop a profoundly delicious crust through the magic of our friends dehydration and the Maillard reaction. When done properly, the method gives the outside of the meat, or the skin of fish, a crackling, potato chip–like crispness. It's a textural masterpiece that feels thin and delicate as it shatters when you bite into it. Flavor city: As the butter melts and then browns, it, too, goes through complex flavor-development processes like the Maillard reaction and caramelization, growing nutty and rich. Your meat or fish is bathed in this delicious fat, picking up all that flavor along the way. To top it off, with aromatics in the pan like garlic, shallot, and herbs, the fat gets infused with all their flavor, which comes along for a ride on the meat. Quick results: Butter-basting is a hands-on process, so it involves more active time than sous vide or the reverse sear. But, from start to finish, it's one of the fastest methods available to you. Because you're cooking the meat from below and also above by spooning the hot fat over it repeatedly, it will cook faster than if you were to sear it without the basting procedure. What are some reasons you might not want to use this method? Inexperience: If you're just getting your sea legs with cooking meat or fish, you may prefer an easier and more foolproof method like sous vide or the reverse sear. You want that perfect edge-to-edge level of doneness: If nailing the doneness of a piece of meat and minimizing the ring of overcooked gray below the surface is your highest priority, you're much better off using sous vide or the reverse sear. Those methods give you much more control over the final internal temperature of your meat, and they minimize the doneness gradient from the center to the edge. You can still get a pretty good sear on your meat using these methods, just not as good as the full-blown pan-searing method with butter basting. Consistency: Sous vide and the reverse sear are much more precise cooking methods, allowing you to hit whatever internal temperature of the meat you desire, which greatly increases your margin of error. If you want excellent results consistently, those methods are the way to go. This is especially true if you're cooking for a crowd, where it can become increasingly difficult to juggle multiple steaks, chops, or fish fillets while trying to get them all just right at the same time. If you're feeding a group, I'd highly advise using those more consistent methods. Speed of active cooking time: Sous vide and the reverse sear take more time overall, since you're heating the meat up at lower temperatures, but much of that time is hands-off. If you're able to get things set up in advance, there's a lot less time spent at the stovetop after. Just slap the meat in a ripping hot skillet long enough to get a good sear on all sides, and you're ready to eat. Size of your roast: The bigger a roast gets, the more likely I am to use a low-and-slow approach like sous vide or the reverse sear. That's because it takes much longer for heat to reach the center of large roasts like a prime rib or a rack of pork, leaving more time for their exterior portions to overcook. Pan-searing with the butter-baste is therefore most appropriate for smaller cuts like individual steaks and fillets (though they should still have enough thickness that you don't risk totally overcooking them in the process). The type of meat you're cooking is also a consideration: I happen to love lamb at all doneness levels, so I'm more inclined to roast a leg of lamb at higher temperatures, giving me a bigger gradient of doneness from medium-rare all the way up to well done. I'm much less interested in that for something like a rack of pork, where the overcooked meat is dry and unpleasant. Your preferences may differ, though, so think about the results you want and proceed accordingly. Can You Combine Sous Vide or the Reverse Sear With Butter-Basting? Can you? Well, sure, you can, but it threatens to defeat the purpose of using sous vide or the reverse sear in the first place. The whole idea behind those low-and-slow methods is to minimize the time the meat spends in the pan with the exterior overcooking. If you cook your meat first sous vide or with the reverse sear, and then put it in the pan for several minutes spooning hot butter and oil all over it, you might as well have just cooked it in the pan from the beginning, since you'll end up with the same results: a delicious crust with a bigger gradient of doneness underneath. Is there a workaround? Yes, you could us the "fat flash," a method Kenji has written about before in which you slap your meat with scalding hot fat right before serving it. What you'd want to do is melt your butter in a pan along with aromatics (like garlic or shallot) and herbs (like thyme) until the butter has browned and is screaming hot, then pour it over your sous-vide or reverse-seared steaks (which you've already seared briefly in a pan to get a crust) just before serving. This will give some of that buttery flavor infused with aromatics without excess time in the skillet. Another workaround would be to brown butter with oil, herbs, and aromatics in the skillet before adding the sous-vide or reverse-seared meat, then use that to sear the meat. This is something Kenji does with his sous vide halibut recipe. You'll get some of that good, buttery flavor and the flavor of the aromatics, but you still won't get the same level of crust and Maillard reaction as you would by doing all the cooking in the pan, since you want to minimize the amount of time in the pan if you want to preserve your perfect internal doneness. This method works for thick-cut steaks, chops (whether pork, veal, venison, or another meat), chicken breasts, and more. Try to use cuts that are at least one and a half inches thick or thicker for best results. Start by salting your meat. If you have the time, the best way to do this is to "dry brine" it by seasoning it all over with salt, setting it on a wire rack set on a rimmed baking sheet (for good air circulation around all sides), and refrigerating it for at least 45 minutes, which is long enough for the salt to draw out water from the meat, form a brine on its surface, and then dry as the brine is reabsorbed and evaporates. If you're working within a tighter timeline, then just season the meat all over with salt right before putting it in the hot pan. What you don't want is wet meat hitting the pan, so in either case, make sure to dry it well with paper towels if you need to before adding it to the pan. Wet meat doesn't sear; it steams, reducing the speed at which a good, brown crust will develop. Using a cast iron or carbon steel skillet, heat a small amount of oil until it's nearly smoking. Cast iron and carbon steel are ideal because they retain heat well, meaning their temperature will remain more stable when the cool meat is set on their surfaces. Flip the meat often; contrary to the common advice to flip only once, frequent flipping delivers just as good of a crust on the meat, with a more evenly cooked center. Once a good initial sear has developed on both sides of the meat, add unsalted butter to the pan along with aromatics. A garlic clove or two, or a halved shallot, are both good ideas, as are woodsy herbs like thyme or sage. The butter will melt and the herbs and aromatics will infuse the fat with their flavor. Soon, the butter will begin to brown, growing rich and nutty. 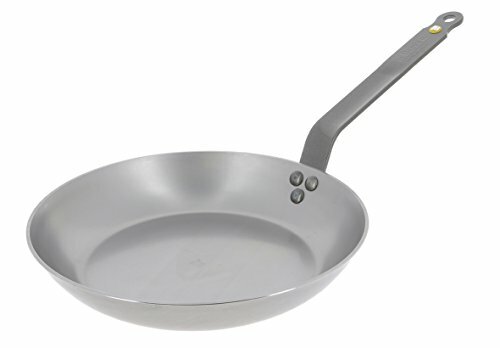 Lift your skillet by its handle to tip it, allowing the fat to pool at the bottom. Using a large spoon, begin scooping up that fat and dousing it all over the meat. Make sure to stop and flip the meat often—every 30 seconds to a minute—for a more evenly cooked center. Keep basting the meat and flipping it, but pause every once in a while to take the temperature of the meat. To avoid overcooking, we strongly recommend using a good instant-read thermometer. A temperature of 120°F in the center of the steak or chop will get you rare meat; 130°F is medium-rare; 140°F is medium; and above that...well, above that, do what you want, you've already entered well-done territory. Place the steak or chop on a wire rack set over a rimmed baking sheet to rest. The meat will undergo some carryover cooking, meaning that it continues to cook as the residual heat penetrates the meat. If you're cooking a thicker fillet of fish, the process is almost the same as other meats, except that you don't want to flip it. All of the heat should be delivered to one side of the fillet, usually the skin side, which is the side you want to crisp up. The hot aromatic butter will more gently cook the top fleshy side as it's spooned over. This gives great results: skin that's crackling and flesh that's tender and juicy. Note, though, that this technique adds a deeper brown-butter note to the fish. It's delicious, but you may not always want that. Sometimes you want to preserve the clean, delicate flavor of fish, in which case another cooking method, such as basic pan-searing without the butter or poaching may be preferable. Just like with meat, the question of, "What's the best way to cook fish?" isn't going to deliver a singular answer. It depends on the flavors you're craving.